Because your body needs some time for the nitrogen absorbed while diving to dissolve. If you fly immediately after diving the nitrogen dissolved in your body could form bubbles, which may cause life threatening medical complications. This happens because the cabin pressure in an aircraft at altitude, is less than the barometric pressure on the ground. Are you affiliated with PADI? Yes. We are a PADI 5 Star Dive Centre. Our PADI dive centre number is S-22241. Can I charge my camera or similar device on the dive boat? Yes. The dive boats have power sockets at 220v. We cancel on average around half a dozen day trips each year due to bad weather. Customer safety is a priority so we always keep one eye on the marine weather forecast which includes wind speed & wave height. We don’t cancel trips because of rain. To ensure the safety of the dive boat & passengers, we act with caution & sometimes need to cancel trips if strong winds or high waves are forecast. We liaise closely with the boat operators and marine authorities throughout the year, & receive advanced warnings about weather which could be hazardous to boat traffic. Is it possible to complete the theory of the PADI open water course before I arrive in Phuket? Yes. You have the option of completing the theory with us on the first day of the course, with a starting time of 8:00 am. Alternatively, upon request, once you have made a confirmed booking, we can send you the digital online materials for the PADI open water course, enabling you to complete most of the theory before you arrive. We don’t charge extra for this. Guests completing the theory online in advance, can start the first day of the course slightly later at 11:00 am. Yes. We charge 2,500 THB per day for non-divers / snorkelers. This includes transfers, snorkeling equipment, breakfast, lunch & refreshments throughout the day. Please note that the King Cruiser Wreck trip is not suitable for snorkeling, but non-divers are still welcome. Yes. We cater to all dietary requirements like vegetarian, vegan, etc. There is no pork served on the dive boats. Food is generally a mixture of western & Asian cuisine, & usually it’s excellent. Do you provide DIN adapters for guests that need them? Yes. There is no charge for this. We accept online payments by credit card, PayPal & cash or credit card at the dive centre. Yes, we can check dive certifications in the PADI database. All we need is your full name as it appeared (Including middle initial if you have one) on your PADI certification card, and your date of birth. Is scuba diving insurance included for you PADI courses & day trips? Yes, we have basic dive insurance cover for all our guests. For guests wanting insurance with premium coverage we recommend DAN, who offer very affordable & comprehensive dive insurance. Is dive equipment includes in your prices? PADI courses include equipment, while for day trips for certified divers it’s charged separately. Liveaboards it’s also an additional cost, unless we state it’s included in the price. If you’re unsure, ask us. Rest assured we never try to add on last minute costs. All costs are clearly sent to guests by email, before booking. What are National Park & Marine Park fees? These are fees the Thai authorities collect from tourists including scuba divers, entering a National Park or National Marine Park. They are subject to change. Currently there is a 600 THB National Park fee for scuba diving at Phi Phi. Similan Marine Park fees start at 700 THB for a scuba diving day trip & increase with the number of days spend diving in the Similans. Marine Park fees for a four night Similans trip are currently 1,800 THB for scuba divers. All park fees must be paid for in cash (Thai Baht) to the park police when they collect the fees from each dive boat. Can I take a Similans liveaboard if I’m PADI open water certified? Yes. 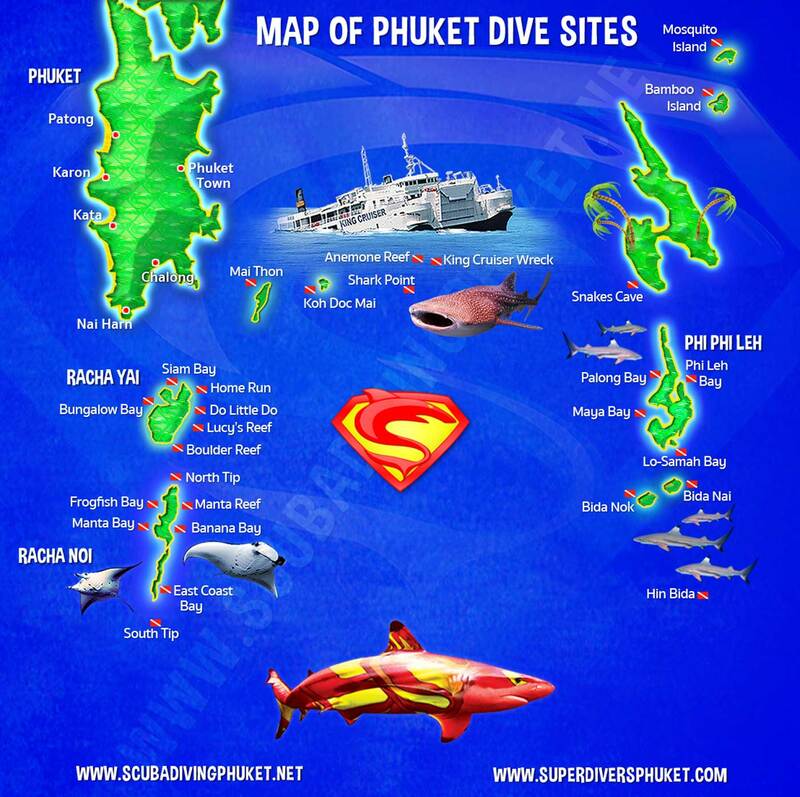 All the dive sites are okay for open water certified divers, but their depth will be restricted to 18 meters. 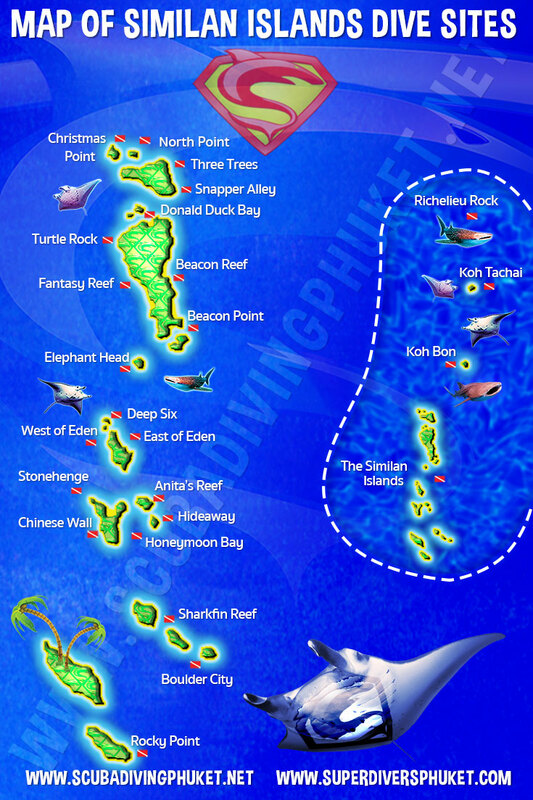 Some of the dive sites have deeper areas. Divers holding the PADI advanced certification will have a maximum depth limit of 30 meters. If open water certified divers want to dive deeper than 18 meters, they will need to take the PADI advanced course either before, or during their liveaboard. The PADI advanced course can be taken on all Similan liveaboards. Can I dive on Nitrox on a Similans liveaboard? Yes. There is usually an additional charge for this. Is scuba diving insurance included if I book a liveaboard? No. All guests taking a Similans liveaboard are required to have their own scuba diving insurance. DAN (Divers Alert Network) offer affordable & comprehensive dive insurance. No, we don’t recommend it because of safety concerns. The conditions in the Similans aren’t ideal for learning to dive. Is it possible to have a cabin to myself on a Similans liveaboard? Some liveaboards offer single cabins, but they are priced at a premium. On liveaboards which don’t have single cabins, you’d be required to pay a 90% surcharge to secure a cabin to yourself. We book many Similan liveaboard guests traveling alone onto liveaboards. Guests traveling alone are usually allocated cabins which will be shared with other guests. Occasionally, if a trip isn’t full, a guest traveling alone may be allocated a cabin to themselves, but this can’t be arranged in advance due to last minute bookings etc. When is the Similans liveaboard season? The Similans are open for tourists & scuba divers from mid-October to mid-May. For the five months, in between, the Similans are closed to all tourism, by order of the Thai government. What benefits will I get by booking a Similans liveaboard with you? Honest advice, our experience from working in the dive industry here for more than twenty years, good customer service, better equipment or equipment deals, a better cancellation policy, no credit card surcharges, & more too. Can my partner who doesn’t dive join me on a Similans liveaboard? Yes. The cost for non-divers on Similans liveaboards is usually 80% to 90% of the diver price, depending on which liveaboard. Is there WIFI on Similan liveaboards? Sometimes yes, sometimes no. A lot of the liveaboards have WIFI, but it’s patchy, depending upon the boats location at the time. 4G coverage is also available, but again, the signal strength depends upon where the boat is at the time. Do you include dive computers with equipment? We include dive computers with PADI courses where students need a dive computer. For certified divers taking day trips or liveaboards guests won’t be required to have their own dive computer as they will be guided by professional PADI instructors or dive masters. If certified divers wish to, they may rent dive computers separately on the boat.